It's very red and sweet-tart and I love it. I daresn't claim that it is as good as All8's, but it's close enough that it doesn't make me sad, and isn't that what home cooking is all about? Not making people sad? Except when what you've cooked elicits pangs of nostalgia, like I plan to have about squash pie someday in the hopefully far distant future when my grandma passes on. But maybe we'll have fixed the death problem before then, and I won't ever have to feel sad eating Hubbard squash or saying "fark." That would be great. FINALLY. The dishwasher is done. Laters. *Speaking of my grandma, "balls" is her favorite curse. We're not sure what it means. I think it's an abbreviation of "balls of fire." She's a cute and most rocking grandma. People. You don't even understand how great this new pan is. It is fifteen and one-quarter inches across. I have a 13 1/4 quart enameled cast iron pot that I call my baby cooker because it's a morbidly descriptive term for the pan's capacity. And I hereby christen my new pan the baby fryer. Have I mentioned that The Gashlycrumb Tinies is a favorite book of mine? Well, it's not, so I'm okay to keep being a parent, DCFS people. Nobody macabre in this house! The house tour went well and Joan brought me a thank you/penance loaf of very exciting-looking bread that I'm eager to try. I am a sucker for bread with seeds in it. But it has to be moist, right? Why is so much bread all dry and crumbly and glum-glum? I may have also bought one for myself for my birthday, used it last night, and been unable to shut up already about how it was the best serrated knife EVAH, thereby convincing them that they needed to own one. I stopped and bought thirty pounds of pitted pie cherries. Because I am not yanking chains of anyone with yankable chains, that sour cherry jam will give you religion. And I want to be really, really religious. Coincidentally, the aforementioned baby cooker is also the right size to do a hella batch of jam. Now I'm going to go scream at my children about the Grass Cloth semi-gloss interior latex they were kind enough to spill all over the family room carpet and couch. I like that they let it dribble out of the can for a good few hours before they came to me to confess just now. I'd better grab the frying pan. Oh, man. One of the ladies who grew up in my house just called me and wants to bring her sister who is visiting over to see the house. I cannot begin to describe how not ready to wear our house is. Lawn, gardens, upstairs, downstairs. They'll be here at three tomorrow. I can't believe I have to work on my birthday! Boys who read this have been duly warned that they're going to feel uncomfortable/bored. I mentioned a while ago that Victoria's Secret employs cottonheaded ninnymugginses who do a terrible job at fitting one for a bra, correct? One of the admins at John's work used to be a lingerie consultant at Nordstrom, the exact kind of lady you want fitting you. A little older, confident, and knows the product backwards and front, like Uncle Rico would want. So he asked her for me where would be a good spot to go to fix my problemas grandes--which I bet was not at all an awkward conversation--and she said the Nordstrom in Fashion Place Mall was the shiznit. So when Troy offered to babysit today (I told you she was sweet and nice, even though I tease her--see how I bite the hand that tends my kids?) I motated on down to the big city and the abysmal den of cognitive dissonance that is the mall. Here's the entrance to the Janitor's Closet Men's Room. And here's the entrance to one of Saddam Hussein's showers the Ladies' Room. Here is the beautifully crafted washbasin area. 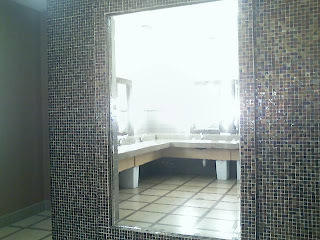 And the floor-to-ceiling mirror in which you can behold your visage. And! 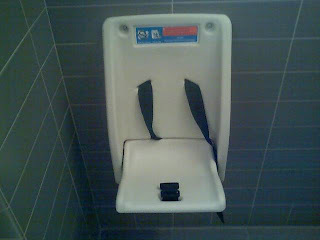 A baby storage seat while you take care of business! So cool. 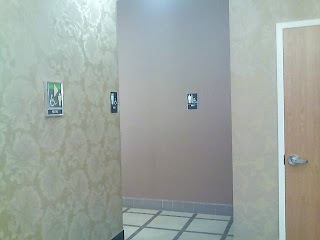 I don't know what the inside of the Men's Room looks like (because: not a man), but I think probably not so much with the movie star treatment and the baby garage. Then I went to Nordstrom, got a PROPER fitting by a PROPERLY TRAINED person, and it's true, I was wearing too big of a band and too small of a cup, just like Oprah or Stacey London or whoever says everyone does. And now I am happy and there is not slipping or sliding or bunching or chafing. Ta-da! So if you're in need of some shapewear, you know what to do. My girl's name was Brandy, and she knows from bras. Also John came to help pick out a new mattress for our bed, since ours is SUCKY and WANTS US TO HAVE HUNCHBACKS, and while we were there we saw an eleven-year old girl dressed like a Bratz doll with her mom who was dressed like an aged Bratz doll. And pretty much every youth I saw was a different variety of Trying Too Hard. Bleh. If it weren'f for the all-you-can-smell coffee odor I'd never go to the mall ever ever. And I bought some cheetah-print leggings to go under my brown skirt and John will shake his head in dismay and say tsk tsk and make rude eighties- and Madonna-related remarks. But I had to tell him to stop wearing pleated Silvertabs when we got married, so I am the fashion mayor of our house in perpetuity. oh, we used to dream of livin' in a corridor! would ha' been a palace to us. John likes to tell stories of how destitute his family was while he was growing up. Mom and Dad working their fingers to the bone just to put food on the table, Cream O'Wheat for breakfast every day, hamburger the only source of protein, one glass of root beer for a treat on Sunday night, one bowl of boxed cereal for a treat on your birthday, rags for clothing, huddled together for warmth under a tarp, the kids making Nikes for fifteen hours before going to their other job thinning onions . . . that sort of thing. But I looked around his parents' house. Oreos in the cupboard, pizza and multiple flavors of Blue Bunny ice cream in the freezer, steak in the fridge*. What was he talking about? John assured me that it hadn't been like that when HE was living there, and it was Daniel and Matthew who were reaping the benefits of all the years of scrimping and saving. I told him confidently that MY parents would never sell out like that--they're far too mean, I said. He said just wait. So here we are, all these years later. My youngest sister Troy is the only one living at home full-time still, and do you know that she got a Columbia coat last winter? And it wasn't even for a Christmas present! There are popsicles and ice cream in the freezer, many of them not even from Grocery Outlet (my dad has a grocery problem--once he bought me a gallon jar of Spanish olives, and although I didn't like them a gallon's worth, I thought it was very sweet). Troy has a cell phone and isn't even sixteen, and Aleece tells me that the other night when my mom made Pasta Primavera for dinner, she made a special separate bowl for Troy with no vegetables in it! Sheer madness, I say! When the rest of us were young, it was all, "Eat your vegetables or you'll have to go to the bathroom in a bag! Eat that hamburger gravy even if it does make you barf!" So now I have to eat crow, and John smugly says he told me so. The thing is, if I had been given the privileges that Troy has, I would have been an insufferable snot. I would have been bratty and rebellious and sass-mouthed. But Troy is about the nicest girl you could ever hope to meet. She's funny and sweet and obedient and cheerful and thrifty and clean and brave and reverent and here we are into the Scout Law, so you know it's serious. So I guess it's all for the best, but I sure wish I hadn't had to wear that shiny brown hand-me-down boy's snowsuit. *Full disclosure: the steaks were and still are petite sirloins. So they haven't completely sold out. Maybe I should stop buying ribeyes . . . I'm not saying Typhoid Mary was a good person or anything, but maybe she felt bullied and trapped by her situation and didn't know how to make ends meet if she didn't work as a cook, and it's not like she got benefits or paid sick leave. And she didn't realize she was making people sick, is all I'm saying. No, I'm not trying to sublimate my guilt, why do you ask? I bet Cool Ranch ice cream would make the worst breath ever. I say this because I'm hoping there's something that can beat the garlic/honey/cayenne pepper paste I'm currently sucking on. It's both not as bad and far worse than you think. I was supposed to sustitute in the Nursery at church this morning, but the doctor told me that God understands if you're sick and I'm not supposed to do anything today, which is a real load off. No parenting for me! I choose not to define a shower as "anything," since I still have some camping residue. Remember when I made zucchini parm last week? It was realrealgood. Here's what you do: open the mandoline you bought for yourself for your husband to give you for your birthday next week. You can use a knife or food processor, but if you're working with the cudgel-sized zukes so common in July you're going to wish you had a mandoline. Then spoon some more pasta sauce over it and do another layer of breaded zucchini slices. One more layer of mozzarella, then pasta sauce, then a buttload of parmesan on top. Cover with foil and bake at 350* for about half an hour, just to heat it through, then brown it with the cover off for fifteen minutes and it will look like this. Everyone in your family will adore it except your ingrate son who hates everything you cook. That's not true--he likes a few things I cook. He's very fond of my biscuits. But this is the child who will stop eating ice cream if he feels full. I told you, he's a CRAZY PERSON. He did deign to eat the dragon tongue beans after we promised that they tasted just like normal green beans. They don't keep their color after cooking--they bleach to a muddy yellow color--but who cares? They're gorgeous anyway, and so easy to see on the plants! They are my new BFF. Dump the pasta sauce into a pan to warm. Stir in about1/2 C of shredded parmesan. Slice your zucchini, then saute the slices until they are soft. Dredge them in panko crumbs, pressing down to help the crumbs adhere (I axed the deep-frying, and the eggwash isn't really necessary). Spread a thin layer of pasta sauce on the bottom of a 9 x 13 pan. Layer on the zucchini slices, overlapping them. Cover the zucchini layer with a layer of mozzarella cheese. If you're using fresh mozzarella, use a wire cheese cutter to cut thin slices. Spread on a layer of pasta sauce, then repeat with zucchini, cheese, and another layer of pasta sauce. Then top the whole thing with a whole ton of shredded parmesan--I'm sure I used at least a cup or two. Cover with foil and bake at 350* for thirty minutes, then remove the foil and bake for another fifteen minutes. Scrumptious. I was really a pig about this dish and ate most of the leftovers myself. I have just finished Les Miserables, so I am crying now. I wondered at the outset of this project of reading the unabridged version whether I would feel like it was unnecessary. It's so long, and there is so much that doesn't concern Jean Valjean, surely much of it is dead wood, right? But I've found that aside from M. Gillenormand's randy transports of fancy, it's all necessary. It's not only the story of Jean Valjean, after all. As Hugo says, the book is the march from evil to good, from injustice to justice; for that to be accomplished, the other stories have to be told, however ancillary they may appear. It's a difficult book to digest, but short story is: the justice system is messed up, liberty is a right of all men, sewers are gross, Marius is a douchebag, Jean Valjean is a saint, and I sort of have a celebrity-old-man-who-doesn't-actually-exist crush on him. It could work, you guys, he's totally nice. And strong! I'm still seething about Marius. I almost wish he were real, so I could shiv him in the kidneys. Or remind him every day that he pettily took the one ray of light from the life of a man who is infinitely his superior, and that his coldness drove Jean Valjean to his death. Then I'd give him a nice paper cut and pour lemon juice in it. While kicking him in the crotch. In the future, I think it would be helpful to read the whole book in one go, instead of in small spaces of time while I'm in the bathroom or getting ready to fall asleep. Teenagers. Sheesh. They remind me that I'm thankful for how loose the garden soil is this year. And I have successfully forced myself into tolerating beets. I find that enough butter to obscure the taste of the beets is helpful. The cauliflower is starting to look a little worse for wear, but it all comes on at once! I can't eat seven heads of cauliflower in a week! Especially when I have combined swine flu/hantavirus. Here's how you know if you have swine flu: do you have a barking cough, or an oinking cough? That joke courtesy of John's uncle Jan. My hair was pretty crazy last week, too, with all the baths I was taking and lack of upkeep. John was very impressed and took a picture. I'm so flushed I look like Ted Kennedy. We managed to get some sour cherry jam made amidst the deluge of sickness--poor John was my crummy little toady the whole week and had to do all manner of busywork, like tearing up carpet and picking a bucket of pie cherries. Note: pie cherries are not a lot of bang for your buck. Not like those sweet cherries I bought from the Barkers at twenty-five pounds for five dollars. Then last night John and I were up until one o'clock assembling one of the pieces of furniture we got from Ikea during their phasing-out-this-line sale. I need some closed storage for the office, and this will do nicely. And our swamp cooler is up, so we're going to be eating Zucchini Parmigiana tonight. I'm stoked. Man, they are not screwing around with that superglue stuff. I just glued myself to an ice cream scoop. Ah, me. That was a good joke I stole from John. I still have what my mom thinks may be hantavirus. Now I have an inhaler and some cough syrup with codeine so that guy who roams around our town breaking into people's houses and stealing their prescription narcotics will have a new option. But the joke's on him, because I'm going to feed any leftovers to the chickens and watch them all stumble around and proposition each other. swine flu! and kombucha! and s'mores! there's something for everyone! Holy CRAP, people. That was no fun. I spent a good part of yesterday in a fog that I can only assume was similar to a drug-induced stupor. That may be related to the 103* fever I had. My whole body felt bruised, including my bones and organs. Bed rest isn't fun like they said it would be, because even with the magic of Hulu and the many lovely shows it contains, eventually your sitting bones wear out. I thought I was going to have to go to the hospital for a broken coccyx, just like Napoleon Dynamite's grandma. But thanks to John and my dad and my family generally taking extra special care of me I seem to have turned the corner. Thus ends the tedious discussion of my health. My English teacher Mr. Wight would not allow use of the word "boring" in his classroom, only "tedious." Now! On to more exciting topics! I never told you guys about when I made kombucha. It's weird, wild stuff. I'm glad I was introduced to kefir first, because its character and process prepared me for the receipt in the mail (from the lovely Tipsy Baker, thank you) of what looks a whole lot like a sheet of human placenta. to hang out in the fridge until I was ready to do another batch (stupid me--if I'd just made another batch right then, maybe I would have had some left over and John wouldn't have had to drive to the Good Earth yesterday to buy some corporate sellout kombucha, because I wanted something fizzy, but pop gives me the hiccups and makes me nauseated--I tried the ginger and it is next on my list of make-at-home flavors). I strained the kombucha into a pitcher, and was glad to see that it was properly fizzy--like sparkling apple juice. Then I poured it into some pint jars to refrigerate, and derived humor from how much it looks like . . . cider, we'll say. In the words of Ned Flanders, "If it's clear and yella, you've got juice there, fella! If it's tangy and brown, you're in cider town!" I guess it's more of a juice/cider hybrid, because it's quite clear, apart from the little flecks of kombucha mother that seem to spontaneously generate, even after it's bottled. It also gets fizzier after bottling. It tastes fizzy like pop, but doesn't make you thirsty, like pop does. It really is a lot like a less-sweet sparkling apple cider. My deprived children love it. Recently we went up and ate dinner in the canyon with some neighbors, and I had a million-dollar s'more-making idea. We'd tried using folded sheets of foil, but it was not user-friendly. So I picked up a couple of disposable foil loaf pans, we faced them toward the fire, and proceeded making our s'mores. You put the graham cracker with the chocolate on it to melt while you toast your marshmallow--no more hunks of cold chocolate. We made all sorts of great flavors, with peanut butter and bananas, dried berries, pecans, chocolate grahams . . . I think I consumed my weight in s'mores alone that night. A thundering success. I haven't patented the loaf pan melting oven technology, so any entrepreneur in the audience is welcome to ditch your Tahitian Noni enterprise and start making prototypes for the Portable S'more Oven multi-level marketing scam . . . uh, scheme, I probably meant. Well, if you were wondering, the diatomaceous earth was all the way useless. I don't know how to get it up and under the head, which is where all the worms like to hang out. This is why people don't grow their own cauliflower--cleaning it is a good fifteen-minute chore. But once it's cleaned, it's buttery and delicious. I think I'll grow it again, because even though the sight of inchworms is rather unappetizing, it lends one's garden an air of respectability that tomatoes and zucchini can't match. Speaking of which, I have some beautiful striped zucchini growing now, and we ate them for the first time last night. Thus begins that fantastic time of year in which people have to lock their car doors at church so they don't end up with a back seat full of zucchini. Traci has been enjoying our garden as much as we have, since she gets the tops from all our carrots and beets and the leaves from the cauliflower. It makes up a little for the long lonely days with no one to bleat to. In other news, I am wicked sick with something super unpleasant. Much of last night was spent writhing and groaning in a most indelicate fashion. Just in time for family reunion season, yay! I just saw a daddy longlegs dragging away the carcass of an earwig. is that what you want me to be, darling? 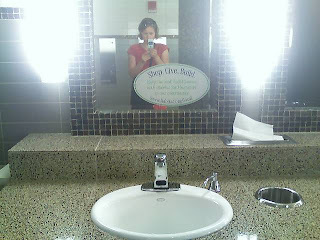 a boring old normal old toilet-goer? Tonight I acted for the first time in my official capacity as a member of the Board of Adjustments. It was a heady tonic, and very exciting, except for the part where two of the Board members ditched and we had to reschedule. I can't divulge any of the particulars, but when we do convene, it promises to be a barn burner with much taking of offense and souring of relationships. Woo! Here's something for you to do: the next time you're out weeding the garden, try accidentally kneeling on some ants, and then have them bite you. Also, you'll be glad to know that the thing on the carpet downstairs was not a giant turd, it was a giant hairball. Skiver has been working on that one for about six months, I swear. Stupid ineffective hairball medicine. It's still irresponsible to drink cream, right? Too bad. The cream I bought from Johnny's Dairy is so thick that it wouldn't pour at first--it was more like Greek yogurt. Today I'm putting up the drapes in Pinga's new room, and I celebrated by making cream biscuits, which are very similar to baking powder biscuits, but faster and probably less accepting of whole wheat flour. They are tender and flaky, and great with cultured butter. And here's the finished floor, with topping and all. What a relief. Post-sanding, pre-staining. 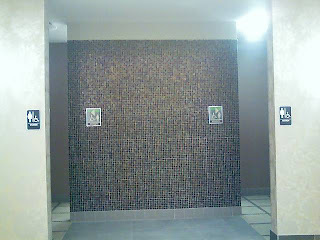 This is as far as we wanted to take it, because 14 sheets of sandpaper were all we were willing to pay for. For trues I am so tired of that floor. This weekend has been grueling. But I just applied the first coat of Varathane, and I'll do the second coat during Pinga's nap this afternoon, and then we're done! We can subject it to normal use after three days, and that means we can start digging our way out of our Grey Gardens phase. Because seriously. Post-staining. How did we get such a lovely color, you ask? Well, that comes from one coat of Jacobean, followed by dissatisfaction, followed by exchanging the other quart of Jacobean for Ebony, one coat of Ebony, dissatisfaction again, then another trip to Home Depot for another quart of Ebony, followed by more dissatisfaction, followed by rueful acceptance. We call the effect "Organic Weathered." There are blossoms on my cantaloupe-in-a-bucket, which is gratifying. The garden is performing quite well, considering the neglect it's been subjected to for the last week. We're basically done with the beets, aside from the few I'm going to use to make kvass, which sounds like a terrifying drink. I think I'll put the rutabagas in the beet rows--I was supposed to plant them on July 3rd, but I was a little busy rocking the floor so hard. I like rutabagas in our boiled dinner--carrots usually get too soft, but parsnips and rutabagas are great along with the potatoes. John speaks of a dish he ate while in England, called "Swede and Potato Mash," which is rutabagas mashed with potatoes. It sounds intriguing. There are even some little fruits on the tomatoes, which has me giddy. I love tomato season, and I'm especially looking forward to my Ananas Noires. And my Brandywines, because I'd like to know if they're really worth all the hype. I tried growing them once before, but remember the neglectful garden parent part? As a member of Generation Now, I might try digging a hill of potatoes in a few weeks. The rest I'll leave until fall, so I can have some big hummers for storage. Eeee! Isn't it so pretty? I took the picture before I dusted it with DE to keep the worms out. I'm getting less sqeamish about tiny worms in salads and cherries, but those big old inchworms are still a rather tall order for me. And here's what it looks like over in Cucurbit Hill. I don't know why some of them are so teensy still, since they all get equal water and sun. It makes me concerned that I won't have a crop before it freezes, and I don't even know what I won't have a crop of! I hear that people sometimes label their plants, but I'm a rugged individualist. Today we'll sand the floor, and before we return the sander we're going to tear up the carpet in the current bedroom/future office to make sure the floor is actually finished and doesn't need attention like the whiny baby we just unearthed. Here is John, looking like a murderous fiend. It's in sort of rough shape in there. I blame the tarpaper, which is an invention of Satan. But the stain we got is going to look really nice, I think. It's a darkish color, but hopefully not so dark that the dust will show up too much. Yeah, it looks awesome. I don't even know why we're bothering to refinish it. We just like makework, I guess. I hope to get the sanding and two coats of stain done before we head over to Logan. It would be nice to get the first coat of Varathane on there too, but seeing as how it's us doing the work, we'll be lucky to get it sanded. I am so thankful that John stayed home from work yesterday to help, because I hit a really low point emotionally at about five in the afternoon, and I would have dissolved into hot, snotty tears of impotence if he hadn't been there to pull me out of my funk. I need to remember that when removing tarpaper, boiling water is your best friend. In movies and television the women who are doing hard manual labor always manage to look sexily disheveled, but for some reason I usually end up looking like Ma Gogan. Plus in this photo I seem to have crazy lady hair like that nasty Gosselin woman who is taking up all the news these days. Truly, I am of most women most miserable. Here's what it looks like today. I'm off to Cherry Hill to give my aching legs and hands a break. I feel like I've been doing squats and lunges for two days straight.